I do love reading from Beyond Faith. It gives me a chance to show readers what my characters have to contend with (besides the main character, PI Dana Bowman). Last Thursday, I joined 10 other Sisters in Crime (well, one brother, author Ken Ogilvie) Toronto for their monthly gathering for an evening of reading from our newest books. And was it interesting – all that crime and so many variations, so many voices, so many stories, and so many photographs, thanks to SinC Treasurer, Terry Dixon. Location! Location! It isn’t just for selling and buying real estate. We were in a library – all those books, albeit we were upstairs in one of the program rooms. To me it was especially good, as Beyond Faith is on order for three copies for the Toronto Public Library system. The other two, Beyond the Tripping Point and Beyond Blood are already in the Toronto Public Library (and in other libraries in other cities and towns, too). And this time I kept Ms. Dana Bowman, Private Investigator, firmly between the book covers, although I did hold up an enlarged photo of her at the beginning and ask the audience if they had seen her and if so, to shove her back in the book. We authors also had a table to sell our books and I sold a few Beyond Faith copies, including one just as I was setting them up on the side of the table before the readings. That might also be “location, location”. And we also received Sisters in Crime Toronto Chapter mugs – red print (what else in colour for mystery authors?) on white. Now, that’s my coffee mug to start each day – gotta get into the mood for committing crime – between the book covers, of course. Here’s some more info on Sisters in Crime Toronto. 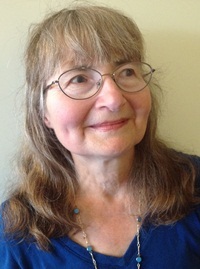 Members also include readers – the mystery author’s biggest fan. Creating characters that resonate with your readers, characters that are three dimensional – in other words credible characters – is not always easy. But it can lead you down interesting and unexpected pathways and forge a bond between author and character. Sometimes that bond means the character thinks he or she is writing the story. That’s what happened with the main character in my Beyond mystery series – PI Dana Bowman. Maybe it’s because as part of my book promo she comes to life when I dress up as her for presentations in libraries,cafes and the like. I have to keep reminding Dana that is is my name, not hers, on the book cover as the author. And we really are not alike, so not the same person – as I keep telling Dana. If you create a character from real life, make sure you use the real person as only a kicking-off point – perhaps how they look, perhaps one distinctive characteristic and create from there. Don’t steal other authors’ characters – evenly loosely disguised as your so-called character. Personal experience and knowledge can help in creating and developing characters. but remember you are creating fictional characters for fiction, not writing a memoir. An oxymoron – fictional characters must come across as real characters, real people, so readers can connect to them. Once created, characters don’t remain static – they evolve; they change, even in just one short story, and more so in novels, especially series novels. I have lots more info on this and will be teaching a workshop on Creating Compelling Characters this Sunday, November 5, from 2 p,m. to 4 p.m. with the Toronto Writers Circle at the Toronto Reference area. It is free and open to the writing public. Here is the library info about the group and location. If you live in the general area you might like to join us.